WRANGLER JEANS STRAIGHT REGULAR LEGS VINTAGE DENIM GRADE A 28 in. to 42 in. Vintage Wrangler Texas Stretch Original Fit Mens Jeans 26 in. 44 in. MENS WRANGLER CHINO JEANS SOFT STRAIGHT LEG VINTAGE SIZE 28 in. to 42 in. Good used condition please note the orignal zip has been replaced, please see photos. When considering a correct fit please refer to the Actual measured size as it is common for jeans to change size over time and differ from the label size. .
Good used condition the zip has been replaced, with some lines above the hems where they have been worn tucked under, please see photos. When considering a correct fit please refer to the Actual measured size as it is common for jeans to change size over time and differ from the label size. .
New with tags, please see photos. . Fit: Straight. Material: Cotton. Colour: Blue. Condition: Excellent Used Condition - the item shows very few signs of previous wear - Reworked length. Label Size: W28 L32. Fit: Bootcut. Style: Iris. Type: Jeans. Material: Cotton. Colour: Blue. Very good used condition please note the waist measures less 32" than the label says and the legs have been shortened to 30", please see photos. When considering a correct fit please refer to the Actual measured size as it is common for jeans to change size over time and differ from the label size. . EXCELLENT VINTAGE CONDITION, SEE FULL DESCRIPTION AND PHOTOS FOR DETAILS. Colour : dark indigo blue. You can see the rise in the photos. Quality woman's jeans. Style : slim. Fabric : stretch denim. This can be due to the age, condition of the clothing etc. I am only human though and may unintentionally miss things. IMMACULATE VINTAGE CONDITION, SEE FULL DESCRIPTION AND PHOTOS FOR DETAILS. Vintage Wrangler Dayton Bootcut Denim Jeans 26 in. to 44 in. Style: Lia. Fit: Slim Fit. Type: Jeans. Material: Cotton. Condition: Good Used Condition - the item shows minor signs of previous wear - Stretched waist, small marks between legs and on the bottom. Colour: Blue. Womens Wrangler Regular Fit Jeans. Sits At The Waist. Classic Seat And Thigh. Bootcut Leg. In Excellent Condition, With No Wear Or Fraying To The Hems Or Pockets. Garment Size; Size 12 Waist 30". Leg 26". Have Been Shortened From 28". Hem 9". Front Rise 9.5". Zip Fly. Dark Blue Denim. Jeans UK Sizing Guide W24 & W25 Size 6 W34 & W35 Size 16 W26 & W27 Size 8 W36 & W37 Size 18 W28 & W29 Size 10 W38 & W39 Size 20 W30 & W31 Size 12 W40 & W41 Size 22 W32 & W33 Size 14 W42 & W43 Size 24 See Photos For More Detail! Scroll Down For Supersize Photos. Please Note I Do Not Accept Offers! Thanks For Looking! While Your Here Why Not Check Out My Other Items. Discounted Postage For More Than One Item. Please Use Add To Basket And Pay For All Items In One Go. Waist 24" 26" 28" 30" 32" 34". Chest 30" 32" 34" 36" 38" 40". This item is used. Style: Hi Twiggy. Iconic Wrangler jeans are renowned worldwide for their classic style and quality. Wrangler apparel. Leather label patch on back pocket. Classic 5-pocket styling. Iconic "W" stitching details on back pockets. 90s vintage high waist Wrangler jeans. UK8 L31". Grunge stonewash. They are best described as high rise straight fit jeans. The material is 98% cotton and 2% polyester. They are a stonewash colour. The legs are straight fit. The jeans fasten with a zip fly. Waist - 26" equivalent to a modern UK 8. Label Size: W31 L30. Style: Iris. Type: Jeans. Fit: Straight. Material: Cotton. Colour: Blue. SIZE 12, W30 - L30. Vintage Wrangler Alaska Mens Classic Fit, Straight Jeans 26 in. 44 in. ★ W26 L33 Rise 10”. 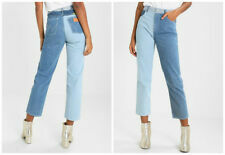 ★Wrangler Denim Flared Jeans ★. Vintage Wrangler Men's Classic Regular Fit Stretch Jeans 26 in. to 44 in. Wrangler 'Corynn' dark ink blue skinny jeans. 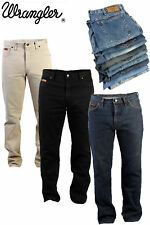 78% cotton, 19% polyester, 35 elastane.Very good quality jeans, strong material. WAIST 24 26 28 30 32 34 36. SIZE 6 8 10 12 14 16 18. CHEST 30 32 34 36 38 40 4. Label Size: W31 L34. Type: Jeans. Material: Cotton. Colour: Blue. Condition: Good Used Condition - the item shows minor signs of previous wear - Small marks on the hem. Trouser Size: 31 in. Size from Label: W30 L31. Material : 100% Cotton. 4/6 - good condition. may have little spots of dirt, small holes, stains, missing buttons (captured on pictures). 5/6 - very good condition - normal, little signs of used. Womens Wrangler Regular Boot Stretch Jeans. Sits Above The Waist. Classic Seat And Thigh. Bootfit Leg. 3% Elastane. In Excellent Condition, With No Wear Or Fraying To The Hems Or Pockets. Hand Measured Garment Size; Size 12 Waist 31". Leg 30". Hem 7.5". Front Rise 10.5". Zip Fly. 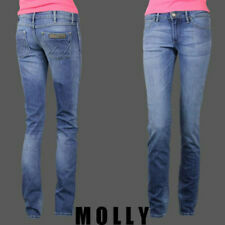 Medium Blue Denim. Jeans UK Sizing Guide W24 & W25 Size 6 W34 & W35 Size 16 W26 & W27 Size 8 W36 & W37 Size 18 W28 & W29 Size 10 W38 & W39 Size 20 W30 & W31 Size 12 W40 & W41 Size 22 W32 & W33 Size 14 W42 & W43 Size 24 See Photos For More Detail! Scroll Down For Supersize Photos. Please Note I Do Not Accept Offers! Thanks For Looking! While Your Here Why Not Check Out My Other Items. Discounted Postage For More Than One Item. Please Use Add To Basket And Pay For All Items In One Go.